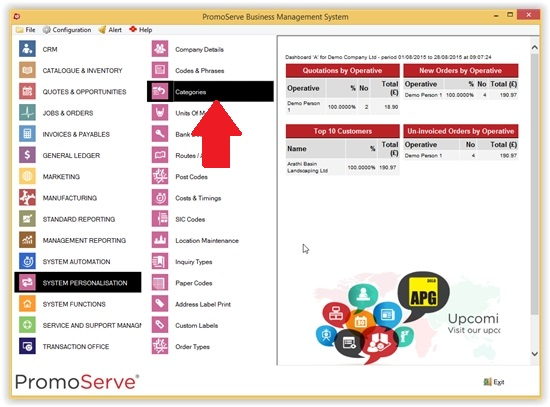 The following document details how the Job Management Center can be used to control Sales and Purchase Order Processing within your PromoServe Software. 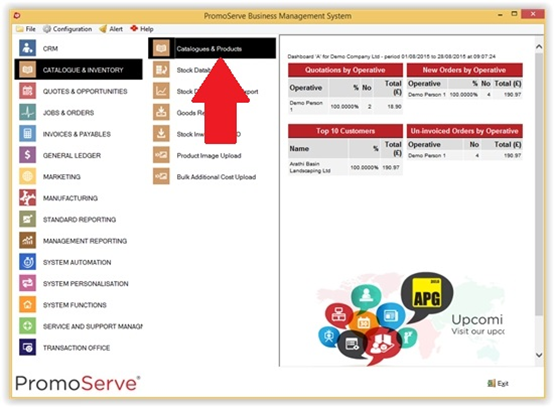 2) Allow you to consider how your own business processes can be applied and controlled through the Job Management Center, ultimately, how PromoServe will be used to benefit your business. 3) Help reduce Resistance to Change as the prescribed process provides a structured approach in beginning to use the software. 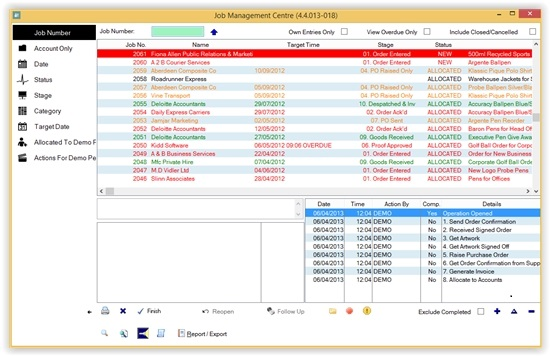 We advocate this approach simply because the Job Management Center provides a means to centralize both Sales and Purchase Ordering through what is known as a Job Bag. Our studies have uncovered that this approach dramatically improves user confidence and understanding, helping to overcome the introduction of a new Business Management System. Account only This lists all the open calls for the customer/prospect which is highlighted at the time. You can also select different companies, by clicking on customer prospect. Status Lets you see if the calls are allocated or closed. N.B to see closed calls put the check in the box in the top right corner; a unallocated call will show as a status of new and so will not be listed in any operatives list. Actions for...This lists any outstanding actions relating to the operative on the allocated to tab. You can select if it is either a customer or prospect by placing a dot in the particular box. You can search for your company, by either typing in their account number, company name, support no and support reference. If you are not sure of these then you can click on the ellipse button and search for the company from the database. Once you have selected your company click on create. Quotations Here you can see if a call has a quote attached to the CRM; you can also insert a quote from here by clicking on insert and following the procedure for adding a quote. Sales Orders Here you can see if a call has a sales order attached to the CRM; you can also insert a sales order from here by clicking on insert and following the procedure for adding a order. 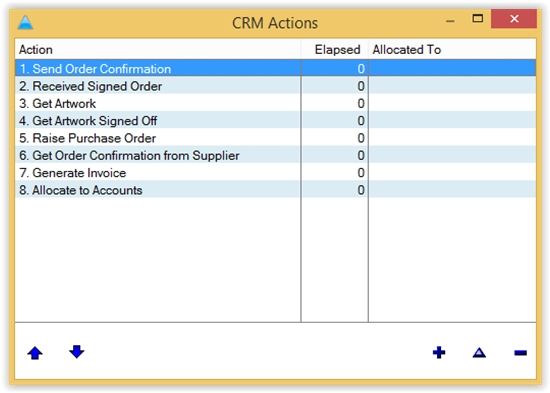 Purchase Order Here you can see if a call has a purchase order attached to the CRM. 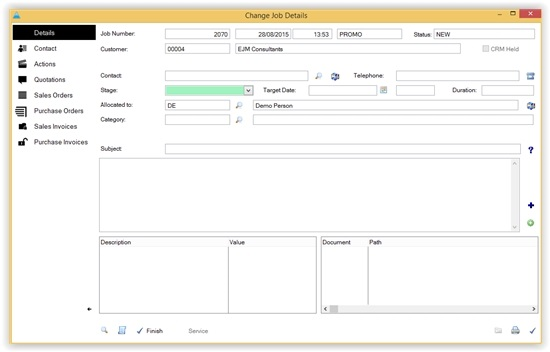 When you are setting a CRM call there are several boxes you need to make sure are filled in correctly. Here you can check that you have the correct account and if there is current support contract set up for this customer. Then the stage and target date boxes will be filled in so you see what kind of support the customer has. The contact box allows you to select a particular person who works for the company, and the product box allows you to choose if a product is associated with the CRM call. The allocated to box allows you to allocate the call to a certain member of staff, who can choose from the list by clicking on the ellipse button. 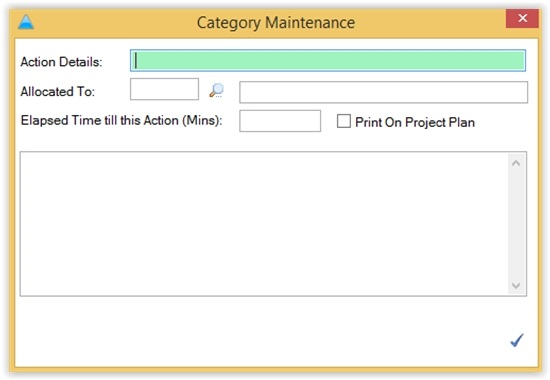 The stage level enables you to assign a certain level of priority to the call; these can be edited in code & phrases. The category box allows you to select what type of call it is; the target date is automatically decided by the priority but this can changed by clicking on the ellipse button. 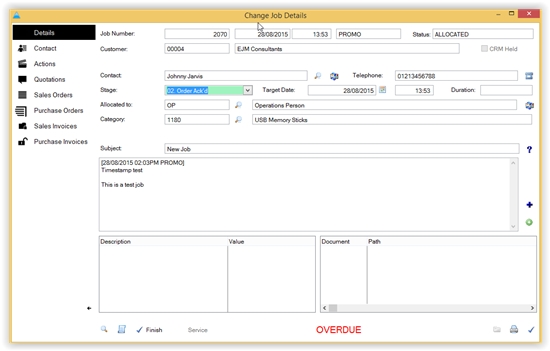 The subject box is where you can type in the subject of the call, and then put the main body of the notes in the box below. If at any stage you need to look at the customer's record, you can click on View Customer at the bottom. Once you have finished with the call then you can click on Finish; it will ask you if you are sure, then it will take it out of the list. By putting a check in any of the boxes below also you to report on CRM calls for a customer, prospect or product. There are several different ways of displaying the information the first tab shows the invoices in date entered order, document allows you to search for a particular reference number you have attached to the invoice and payee allows you to search for a supplier and it will then display all the invoices displayed for them. At the top there is a supplier box if you know their account code then type it in alternatively click on the radio button and you can then select the supplier from the database. 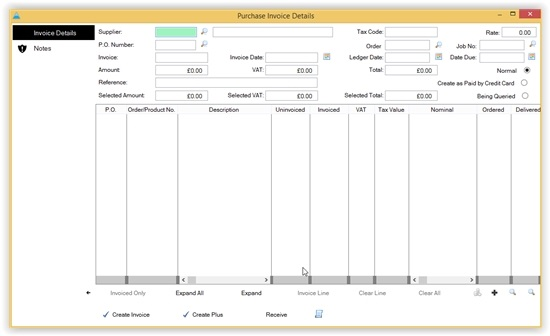 Once you have selected the supplier it will then list all the purchase order on focus which you have raised to them, once you have found the order which relates to the invoice you can either double click on the line or highlight it and click on invoice line at the bottom, it will then automatically enter in the invoiced column the amount of the invoice, if the invoice is for only part of the order, then highlight the order and click on expand at the bottom which will then show you all the products on the order so you can invoice just for what you have received. 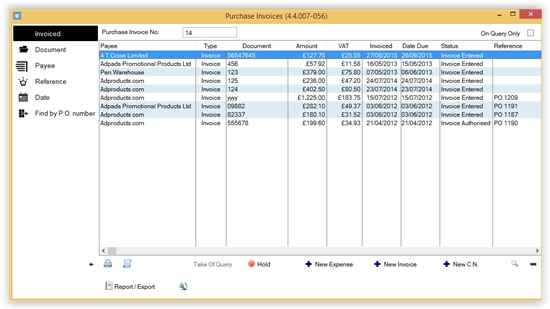 As you can see several different order have been invoiced, the total figure is displayed in the selected amount box, to make sure you are happy with this amount you then have to then enter the same amount in this box then enter in the date on the invoice and click on create invoice at the bottom and it will then add it to the list with the others. If for some reason the invoice from the supplier is not the same as the order you placed, i.e. 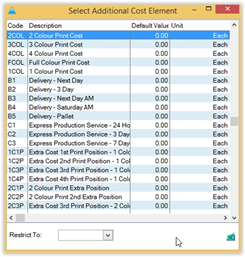 you have received an item free of charge, or you have only received half the order, then highlight the order click on expand, then double click in the invoiced column and you can enter in a different amount to what it shows. If you will not be receiving another invoice from the supplier, double click on the fully invoiced column to change the no to yes, then go through and fill in the value boxes as normal. Click on the Create button. The record card will now appear requiring details to be entered for the product in Question. Within the Details Tab enter the relevant product descriptions etc. IMPORTANT The next step is to click on the Selling Tab and enter the Quantities & Selling Prices applicable to the product. 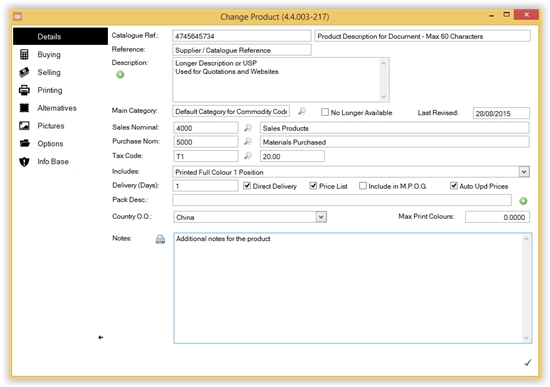 In this example an Origination Charge will be added to the Product. Highlight ORIG (Origination Charge) followed by clicking on the Select Button. 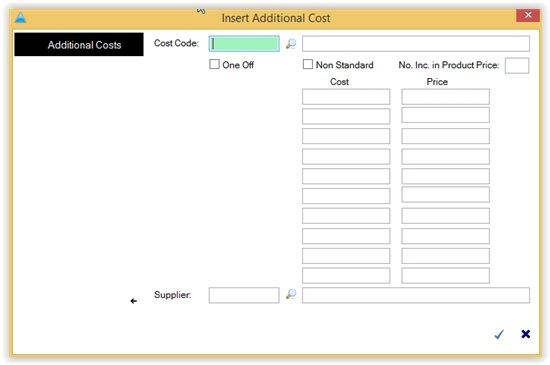 Check the One Off checkbox and enter both Buying and Selling Costs in the applicable textboxes available. To confirm the additional cost price entries click on the Ok button. 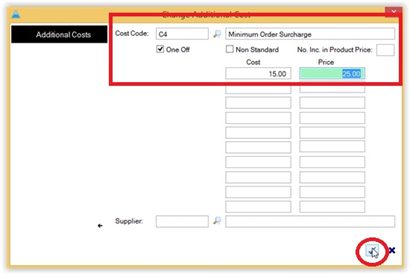 The additional costs for Origination will then be assigned against the new product entry. 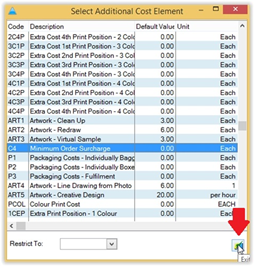 Repeat the process if you wish to assign further additional costs against the Product. To enter a "Preferred Supplier" click on the magnifying glass to the right of "Preferred Supplier". 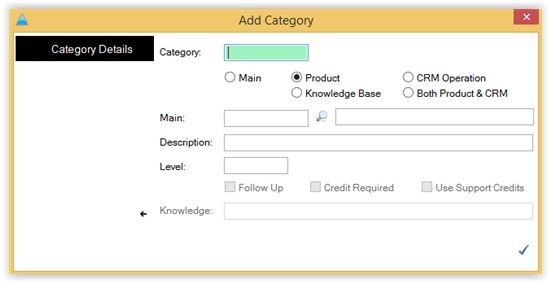 On selection the Supplier Database will then appear. 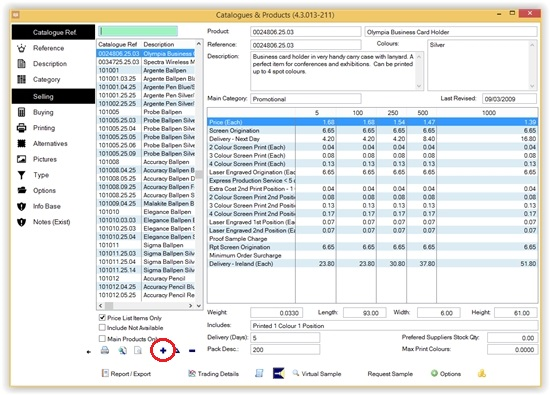 Highlight the applicable Supplier and click on the "Select" button. The Supplier will then be assigned against the product. Enter the Buying Prices in the relevant textboxes. From this screen you can choose to copy a previous PO by clicking on the magnifying glass button, you can select the supplier by clicking on magnifying glass and choosing from the list, or or you can choose a product and choose the supplier afterwards, you can also add a supplier from here as well. Once you have done this click on create. 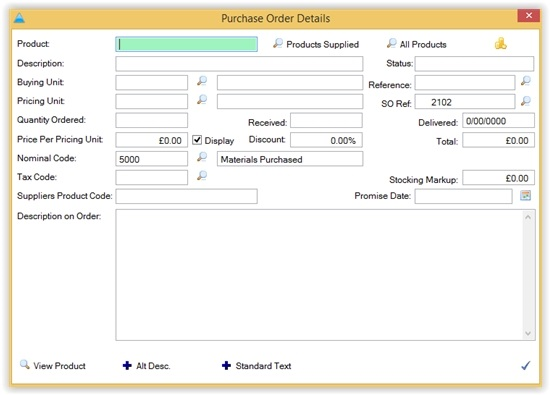 On a purchase order you have three tabs along the top, the first one contains all the details of the purchase order, the contact tab enables you to select a contact from the supplier, the delivery details tab, allows you to choose different delivery addresses also you can choose a customer on the purchase order, so you can see who the order is for. Status This is the status of the purchase order, requisition means it has been entered on the system but not sent to the supplier, new order means it has been sent, fully delivered & invoiced, means that you have received the goods and have been invoiced. CRM reference By typing in the CRM reference number here you can link the PO to the CRM call, and it will appear on the call in the CRM center. You can type in the product code and it will find the product. Products supplied If you have set up suppliers who supply certain products then they will appear in the products supplied button. This will also look through previous purchase orders and list products that the supplier has supplied before. View Product This will open up the product database on that product. As you can see you have various options on how you want to send the purchase order, from here you can also print off goods received notes and address labels. 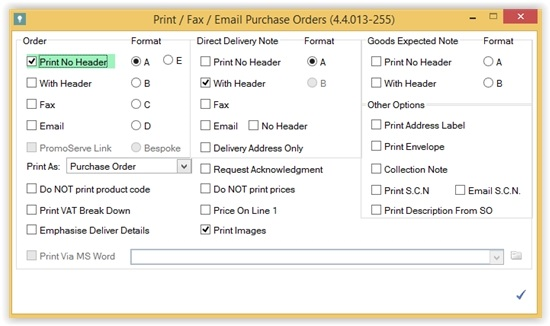 You also have the option to print Direct Delivery notes where the supplier sends an order direct to your customer. 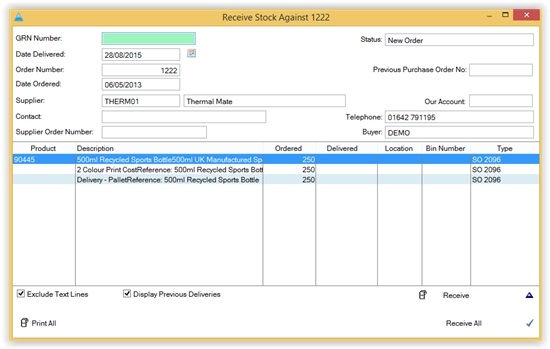 You can also change the status by clicking on the order status radio button in the actual Purchase Order. This is useful for verbal orders. Once you have received stock in through the receipts routine then the status will change to fully delivered, and once you have entered the invoice from the supplier it will change to fully received and invoiced. 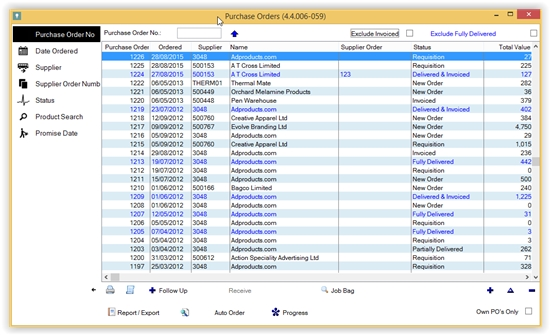 Report / Export This section provides comprehensive reporting on purchase orders. You can set reports to print or be exported as a csv file. 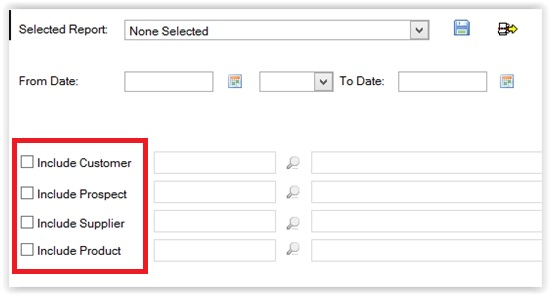 Query This allows you to filter the list to find specific criteria. 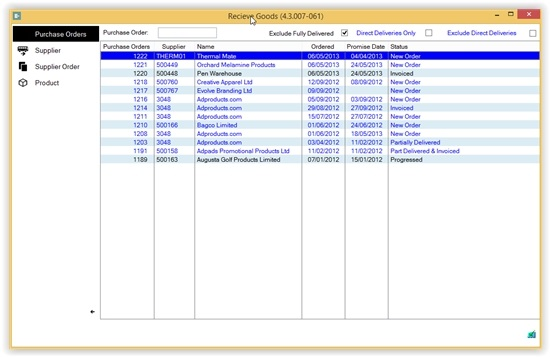 Auto Order This is a useful facility to search through stock required for purchase orders and stock below the minimum set levels and generate purchase orders. 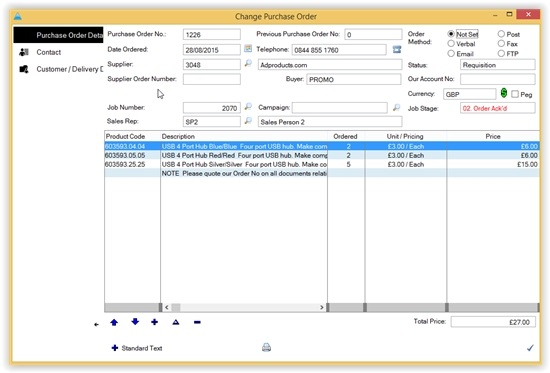 This routine looks through all the orders on the system and works out how much you need to order off your suppliers to meet these orders, you have two options at the bottom the order required button will produce purchase orders for you to fullfil your current orders. 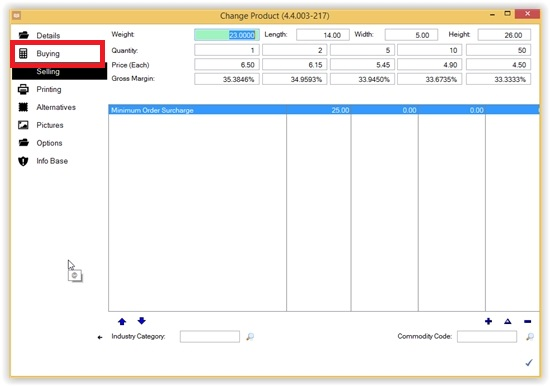 The order replenish qty will look at the replenish qty field on the product in the product database, if the physical stock is less than the reorder level amount then it will a create a purchase order which will take the amount from the reorder qty field on the product page. It will choose the supplier by looking to see who you brought it off last time. You have the option to highlight the record and either change the supplier by clicking on the triangle icon in the bottom right hand corner or remove the item with the minus icon. Purchase Order requisitions will be generated for the required stock. These can then be printed or reviewed and amended as required. You will then get a box like the one shown obelow, you can see each product on the order, to receive the product into stock highlight the product line and click on receive, this will then enter the qty amount in the delivered column so you can part receive orders, or if you are receiving all the qty at once then click on receive all will automatically put all items into stock. 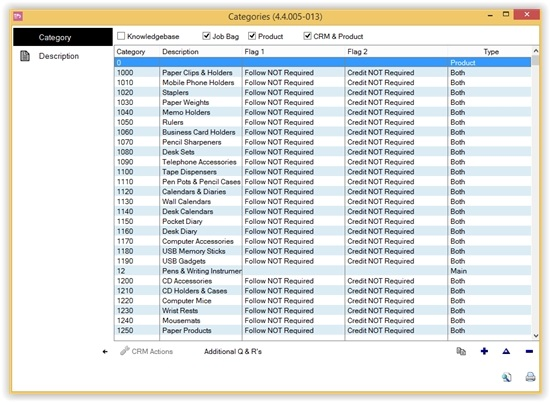 From here you can select locations and give it a bin number, If you are receiving more than one of a item you will then get a extra tab at the top which will allow you enter in individual serial or batch numbers for each unit, this is useful if you need to keep a track of individual product units. This comment will then get recorded against the product in the transaction database, so you can any reason for not having enough stock. 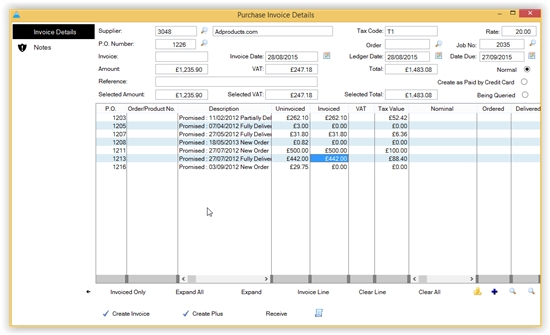 You will need to highlight the invoice number the credit is against.You can then double click in the invoiced column and enter the amount of the credit note. You can also double click in the description field to put a reference number in, once you have done this then enter in the amount in the amount field and click on create credit. 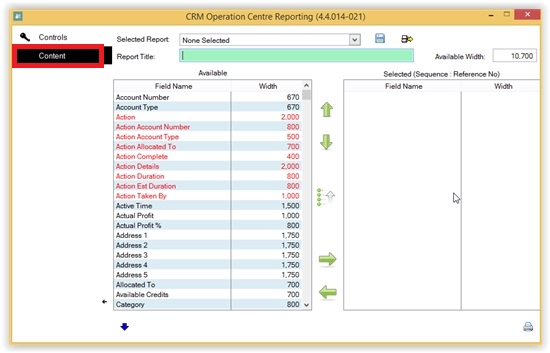 Report/Export Comprehensive reporting can be made to display/print or export to a csv file. 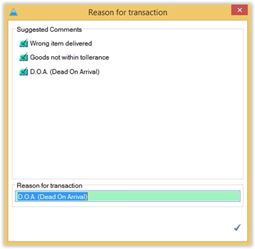 Query The Query function can be used to filter the list of invoices shown. Insert your action details and the notes to go with the action in the relevant fields.When complete select the OK button. The auto action has been created. 10) Create a Job Bag for a Customer raise a Quotation and add 1 Product. Ensure that additional costs are added also. 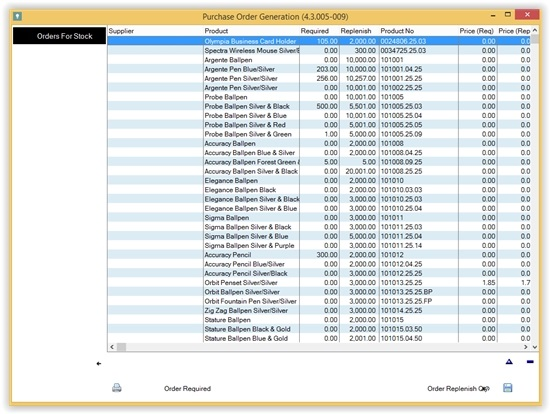 Convert the Quotation to a Sales Order and then raise 2 Purchase Orders the first purchase order for one Supplier for the main product, the second purchase order for the additional costs. Ensure that the Supplier of the main product is delivering do the 2nd Supplier who will be dealing with the additional costs. Ensure that the 2nd Supplier is delivering directly to the Customer. 12) Convert a Prospect to a Customer.